Highlights: 1. Visit the largest number of cities within the shortest time without backward road 2. Visit the Old Fort Niagara and the Whirlpool State Park 3. Stay 2 nights in New York Metropolitan Area with more visit time in the Big Apple! Leave Quincy Market and we will set forth to the Big Apple – New York. In the evening, upon arrival in New York, you are invited to join our delicately tailored New York City Night Tour that accesses you to stunning views of the “Sleepless Town” at $25/person. *New York Night Tour: Start from Rockefeller Center, you will be led sightseeing multiple NYC landmarks including Times Square. Additionally, Hudson Riverside from New Jersey is one of the best locations to have a panoramic night view of the New York City. We will visit Philadelphia where known as the birthplace of American democracy. At the Independence National Historical Park, tour guide will arrange a free time for guests to walk around. 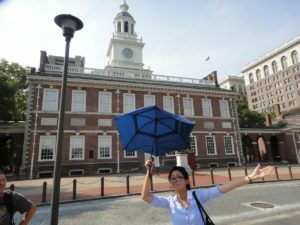 Inside the Independence Hall, you will have a special moment of standing exactly where the Declaration of Independence and the Constitution were signed. You also won’t miss the Liberty Bell, the Statue of Washington, Congress Hall, and other great attractions! Take pictures, and even better, add a smile! Then we will head to Washington D.C. and visit the Lincoln Memorial, the Reflecting Pool, the Vietnam Veterans Memorial, and the Korean War Memorial. Furthermore, we will take a glance at the future of space travel in the Smithsonian National Air and Space Museum, located on the National Mall(also known as the Capitol Hill), with a showcase of all components of human aviation and space heritage. 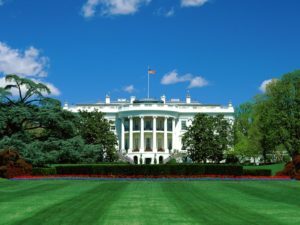 Besides, we can take photos of the White House and the U.S. Capitol from outside due to the limitation of visit time for the public. 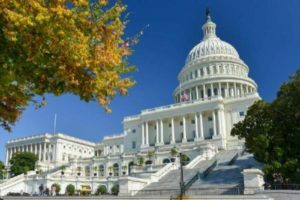 Lastly, you surely don’t want to miss the opportunity to take our exclusive cruise for sightseeing of the town on the Potomac River and Tidal Basin! 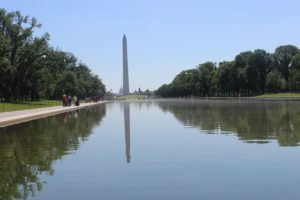 Along the way, you will see and pass by the Washington Monument, the World War II Memorial, the Thomas Jefferson Memorial and etc. We will arrive at Corning Museum of Glass around the noon. Corning Museum of Glass maintains the most comprehensive collections of historic and art glass in the world with 35,000 glass pieces representing 35 centuries of glass craftsmanship. Guests here will be invited to enjoy the Hot Glass Show which is performed by professional glass technicians. After the lunch, we will arrive at the world renowned Niagara Falls. Here, guests can overlook the deafening roar of the American Falls, the Horseshoe Falls and the Bridal Veil Falls! Afterwards, you can choose either: A. to stay in the Falls Park for self-exploration till returning the hotel, or, B. to take Niagara Falls In-depth Tour (Tour fee: $25/person, including $13 of the admission ticket). This interesting and exciting tour includes two popular attractions: the magnificent natural wonder – Niagara Whirlpool State Park and the U.S. historic landmark – Old Fort Niagara. The Niagara Whirlpool’s greatest depth is 125 feet. It is estimated the whirlpool formed approximately 4,200 years ago by the upstream erosion of the Niagara escarpment by Niagara River. Old Fort Niagara is a rich historic landmark; it spans more than 300 years. Its commanding presence on the great lake caused it to play a critical role in the French and Indian War, the American Revolution and the War of 1812. The gorgeous Lake Ontario lies behind the Fort. Upon the sunset, you will also watch a Thundering Water Cultural Show which is a sacred place for the local Native American people. This show uses dance as a storytelling medium through which to showcase the impact that the falls have had on native culture. (The completeness of night view on certain summer evenings may be limited or not available due to late sunset time and US Federal Government regulations on driving hours.) Later we will go to the hotel when night falls.